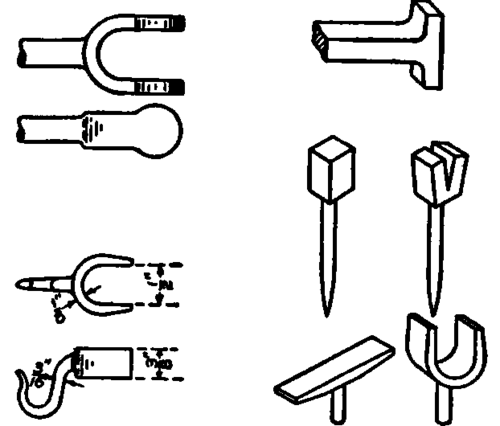 One example of a very numerous class of forgings is shown in Fig. 107. This is the shape used for what are known as marine ends of connecting rods, knuckle joints on valve rods, and various other pieces. 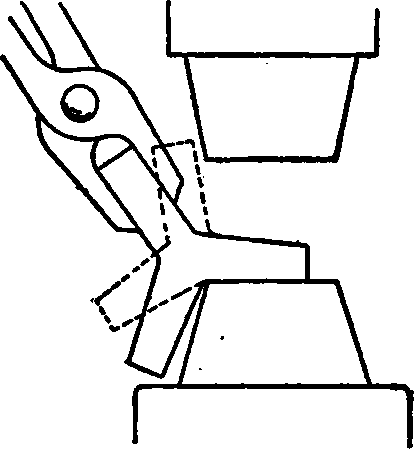 A common method employed to make such a forging is shown in Fig. 108. Two fuller cuts are first made as indicated at A and the part for the shaft of the forging drawn out. The thick end is then punched and split, as indicated at B. This split end is opened up and forged out in the manner indicated in Fig. 109, if the work is done on the anvil. Fig. 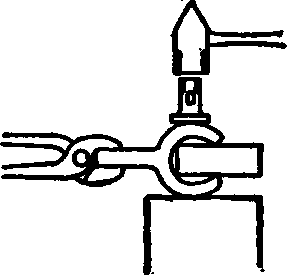 110 illustrates the method of working out under the steam hammer, the end being first flattened as indicated and then gradually tipped up to the position shown by the dotted lines. When drawn to size, the ends are flattened out straight across and the finishing done around the shank with a fuller, as indicated in Fig. 111. 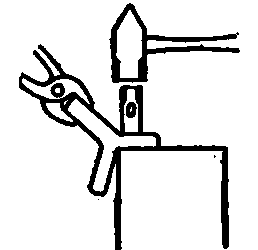 The forging is then bent into a U-shaped loop of approximately the shape of the finished knuckle. 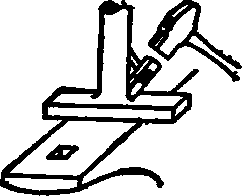 A bar of iron the same dimension as the inside of the finished knuckle is inserted between the sides of the loop, and the sides closed down flat, as shown in Fig. 112. Fig. 113 shows other forg-ings which may be shaped by this same general method. Trim E, Fig. 108, to the dotted line. Fig. 108. Method of Making Knuckle. Fig. 110. Working Out Knuckle under Steam Hammer. Fig. 111. Finishing Knuckle around 8hank. Fig. 112. Closing Sides of Knuckle. Fig. 113. Typical Shapes Similar to Knuckles.